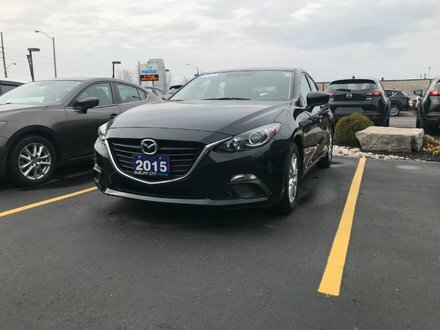 Price Includes: 7 YEAR/140,000 KM LIMITED POWERTRAIN WARRANTY STARTING FROM ORIGINAL IN SERVICE DATE, 24 HOUR ROAD SIDE ASSISTANCE, AVAILABLE EXTENDED COVERAGE, TRANSFERABLE BENEFITS, 30 DAY 3000 KM EXCHANGE PRIVILEGE, LOW LOW FINANCE RATES STARTING AT 0%, Current Mazda Owners are eligible for discounted finance rates! Price is plus taxes and licensing. Each and every vehicle includes the PREMIUM GUELPH CITY MAZDA EXPERIENCE. We put our vehicles through a meticulous 160-point inspection along with our exclusive pre-owned storybook (Including the vehicle’s place of origin, safety report disclosure, car proof history report, and all available service records), providing you complete peace of mind with your purchase. Come in and see why it certainly is worth the drive to Guelph! Interested by the 2014 Mazda Mazda3 GX-SKY 6sp ?